This image tells a little bit of a story. I shot it about 20 minutes before the start of DEJA’s tribute to Pink Floyd’s, The Wall, at the Virginia Beach Museum of Contemporary Art. It shows lead singer John Coleman and bass player Jimmy Wiseman, relaxing before the show. This was to be a compete recreation of the entire album, solely by the band, while the muted video played in the background. It was complete with all the sound effects, lots of props, and pretty ladies singing in the back. This was the second time I had seen the production so I know a huge amount of work went into it before they ever stepped on the stage. The full impact of this image is just not complete without seeing the show. But what is telling is the apparent calm of these two gentlemen, who I knew were anything but calm. I had been asked by the Tidewater Musician’s Alliance to come shoot some of the background photos. There was already an over abundance of photographers who had come to shoot the show itself so I was not going to add to the mayhem. I chose my usual body for low light, my Canon 6D. In order to keep things simple in the crowd that I was expecting to have to navigate, I decided to carry one body and one lens, my Canon 16-35mm. When shooting in and around live music, one can never expect to have much light. And not only is flash distracting to everyone, it kills the color that is so much a part of the event. So I’ve made it standard practice to expect extremely challenging conditions. 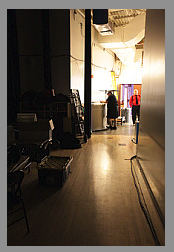 For this particular shot, I ventured out between the curtains from behind the stage. I had wanted to get a shot of the empty theater but I was too late for that and the lights were already heavy on the stage. As I turned around, I saw John and Jimmy standing there and I quickly took aim. Knowing the reflection on the floor was going to saturate, I dialed in -2/3eV with the thumb wheel on the rear of the body, grabbed focus on John, and snapped off the shot. 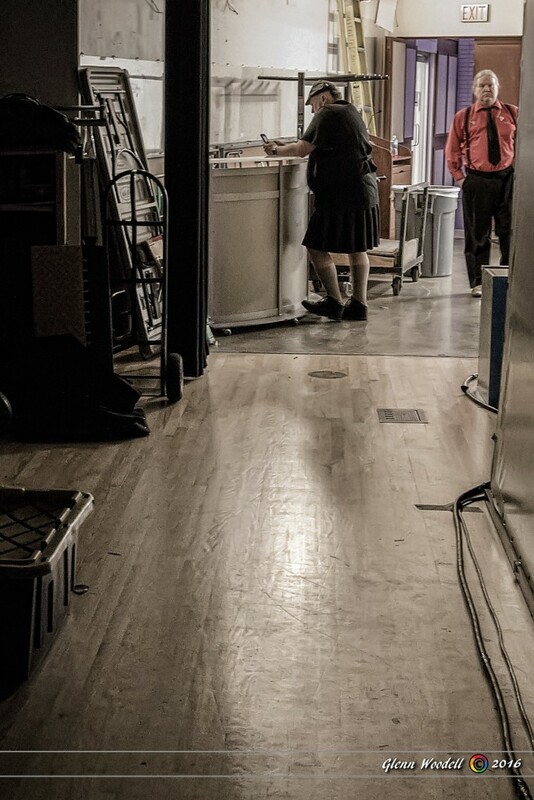 Two seconds later, John turned and walked off, Jimmy stepped farther out of the scene, and someone else walked in through the doorway. I took the second shot but I knew it was a dud, leaving just the one as a potential keeper. Initially, it looked like the floor was completely blown out but I figured I could recover it all. I did a pretty heavy crop on it since at that distance, my 35mm was just not enough, but I had not had enough time to walk the distance to get what I wanted. I didn’t even have time to set the aperture, otherwise I would have never sacrificed that much light for a shot like this. After the usual lowering of the highlights and a little increase on the shadows, I set the white balance on John’s arm, clicking around until I was happy. I reduced the saturation a little because the color just made it too happy and I wanted to reflect the quenched tenseness of the scene. I can’t say enough good about the high ISO performance of the 6D. An ISO of 12800 and a shutter speed of 1/10 second gives you an idea of how much light I had to work with. Having recently started doing all my noise reduction and sharpening in Noiseware, I had those defaults in Adobe RAW turned off. The image cleaned up very nicely and I ended up with exactly what I was hoping for. John Coleman and Jimmy Wiseman, moments before showtime. Click for large image. See my Facebook album for this and other images from the event.